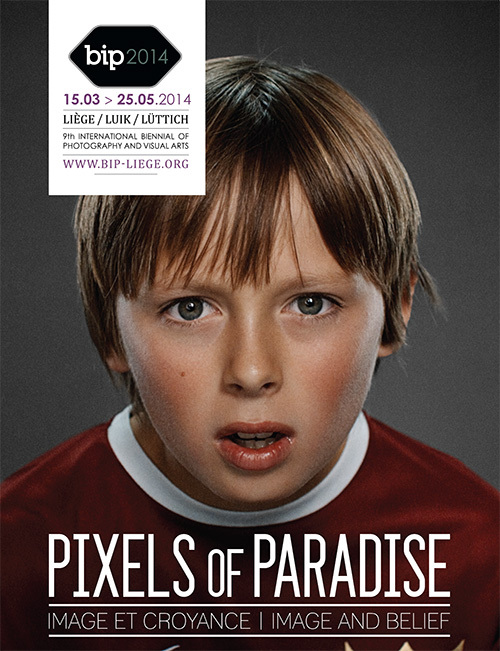 Seeing and believing will be the two keywords for BIP2014, the 9th staging of the Biennial, entitled PIXELS OF PARADISE. Images are always an ambiguous source of promises. Images lie and tell the truth at the same time. Their powers of enchantment and proof go hand-in-hand. It is this unwavering link that BIP2014 will attempt to explore through an eclectic artistic selection where both mystification and the sacred are in play, being, as they so often are, bound together. Seeing and believing are deeply engraved in the Christian tradition and this cultural breeding-ground has implications for the observer’s relationship with images, regardless of whether the beholder is religious or not. Despite the prohibition of the second commandment of the Bible, Christianity has produced iconic images, images which have served as such in worship. Nevertheless, the feud between iconoclasts and iconodules (in the eighth and ninth centuries) shows that when it comes to belief in images, the line between eikon (icon, where the image is a medium to reach the unrepresentable divinity and has symbolic status) and eîdolon (idol, where the image itself is worshiped, as if it embodied the divinity in truth and reality) is thin. Over the centuries, the religious and metaphysical anchoring of images in Western culture has imposed upon us a fantasy of the “unpainted picture”, images produced by printing, transfer or etching; the immense power of this fantasy was revealed with the advent of photography, and afterwards with film and other means of mechanical reproduction of the visible. On the basis of this near irresistible attraction, power, whether it is clearly identified or ambiguous, relies on visual persuasion in its attempts to gain our conscious or unconscious consent. The fanaticism of the image and its attendant effects of belief have, in fact, today taken on a dimension that has never before been reached, perhaps in contrast to a society that claims to be rational. Included within the scope of the image are media and communication industries, spiritual and religious proselytizing of any kind, and marketing and economics, all crudely convened to force us to follow them. Of course, it is not a question of playing “true or false”, but rather of sizing up this enduring balancing act in our relationship with images and their “truths”. Paradise is pixelised.